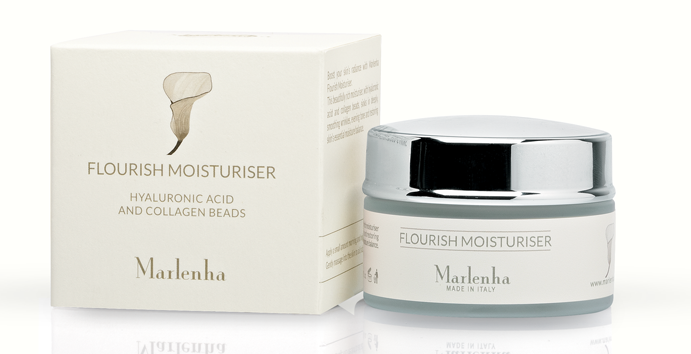 Marlenha Hyaluronic Acid & Collagen Beads Moisturizing Face Cream. Way back in April I had tried out Marlenha Mignon, the miniature kit featuring the top 3 products from the brand - see my earlier review here. About a month back the team at Marlenha got in touch with me again and subsequently sent across a full sized jar of Hyaluronic Acid & Collagen Beads Moisturizing Face Cream. This was the one that I had liked the most of the trio that I had sampled earlier. Suitable for all types of skin, the face cream is very light and gets absorbed easily without any greasiness. The fragrance is lovely too - not very over powering and lingers on for quite some time. The cream contains Hyaluronic acid and Collagen liposomes that are supposed to have an anti-wrinkle action while Jojoba Oil and extra Virgin Olive oil provide the hydration and soothing effect. You can use it as a day cream or a night cream or even better use it both the times :) I have used it primarily in the day because I like its non-greasy effect which is perfect for daytime use. With regular usage skin feels softer and smoother. Update: A little while after my review was published, Marlenha underwent a rebranding. The Hyaluronic Acid & Collagen Beads Moisturizing Face Cream has been re-branded as Flourish Moisturiser. You can see the new packaging below.